VOGONS • View topic - post up pics of your "computing area"
post up pics of your "computing area"
Re: post up pics of your "computing area"
Not the most impressive thing in the world but I like nonetheless. 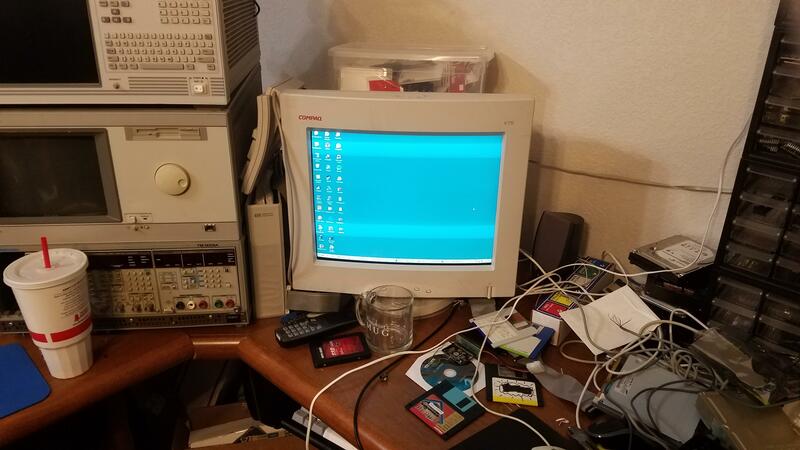 On the left is my main machine (A Packard Bell iStart 1360 running Windows 7) and on the right is my Compaq machine for all things Win98. 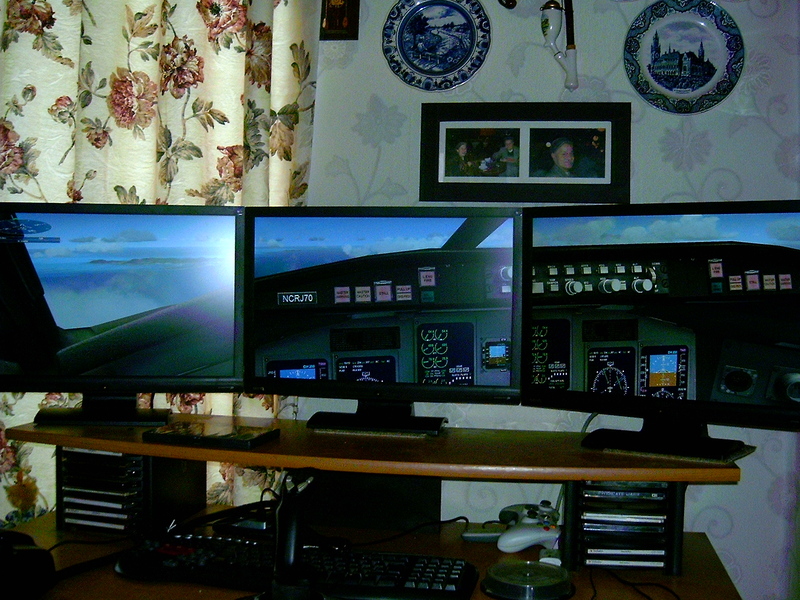 I also prefer CRTs to LCDs, hence why there are no LCDs to be seen in my setup. 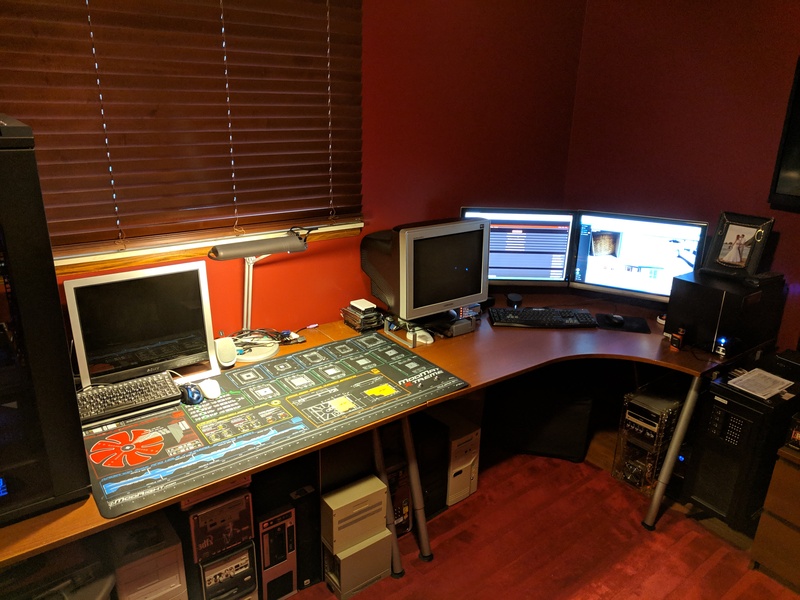 My setup on october 2018, still quite the same except for an additional Pentium 200 MMX + a lot of extra MIDI modules. 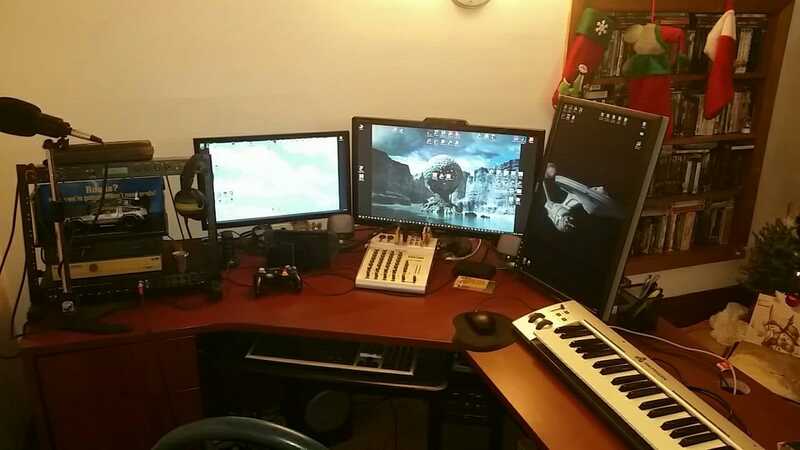 Salient wrote: My setup on october 2018, still quite the same except for an additional Pentium 200 MMX + a lot of extra MIDI modules. Nice room! Is this an Antec Sonata under the desk? MMaximus wrote: Nice room! Is this an Antec Sonata under the desk? Yep, it's an antec sonata piano black. cleaned up a bit, here's mine. Like some of you, i just don't have enough space so every quarter or so i rotate machines. Maybe this spring I'll load up all the commodores! Yes, I have a line of light tape going around the edges of my desk. I can actually change its colors using a little remote, but I chose blue lighting for that picture. My desk contains the monitor for my desktop, my 32" LCD TV, and my laptop. I like to keep my setup clean from a bunch of papers and stuff like that. Not a very flattering setup, but it seems beneficial for a PC that's not my every-day piece of hardware. I'm more of a modern technology kind of person more than a retro tech kind of person, but I do have a tiny bit of interest in older computers. is that light tape RGB? oeuvre wrote: is that light tape RGB? I don't know, but it could be. I control the lighting with a remote that has most of the colors you can find in the color spectrum, such as from blue to purple, from green to light turquoise, and from red to yellow. I have the exact same desk. 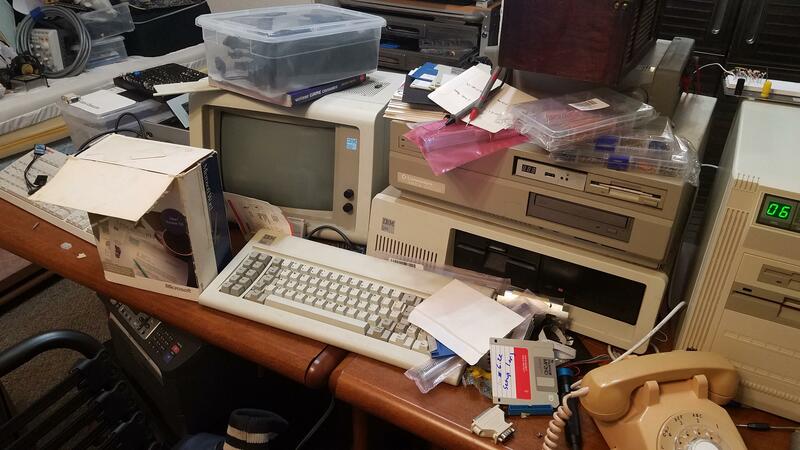 IBM XT, Original 10MB HDD with the original installation of DOS, a Hercules graphics adapter, Ungermann Bass Ethernet card, and 5151 monitor. Amiga 2000HD, 68030? accelerator card, Video Toaster 4000, PC XT bridge card. 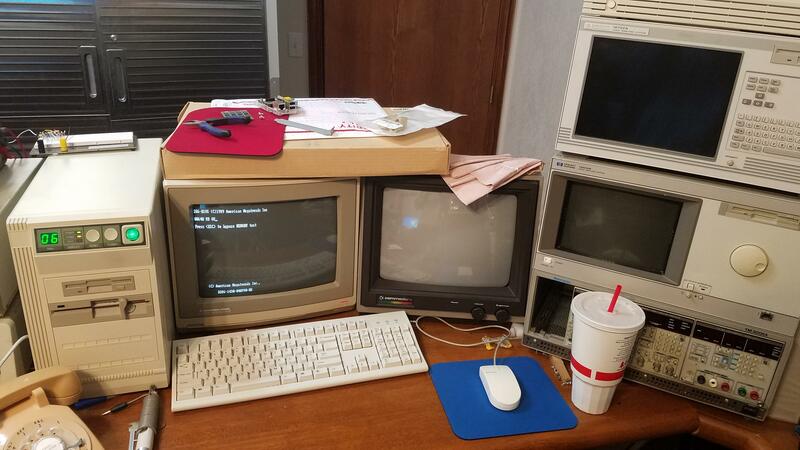 Newly built 286 machine, 12 MHZ, 1 MB of RAM, IBM CGA adapter, MediaVision Pro Audio Spectrum 16, Intel Etherlink 16, and 1.2 GB HDD. Commodore 1084, main display, and commodore 1801 used for video toaster editing. On the right I have the HP 16702a and 16500b logic analysis systems, used for debugging nonfunctional motherboards. Windows XP machine, core 2 duo, 3 GB RAM and a crap ton of HDDs. It's my archive machine. 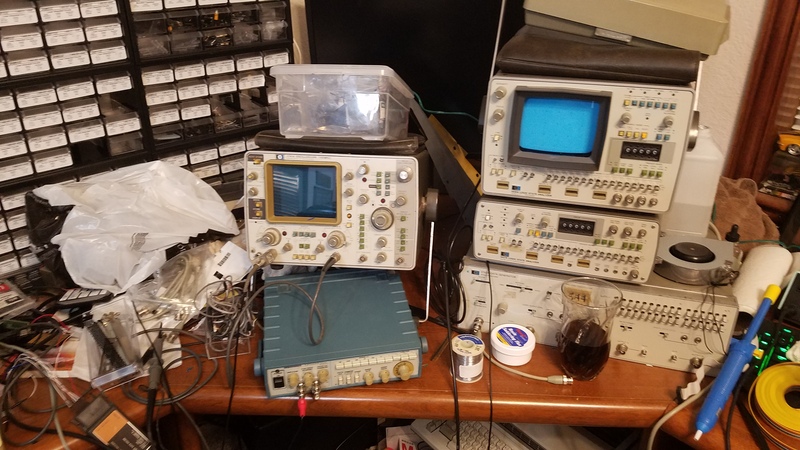 HP 1741A Analog Storage scope, tek CFG253 func gen, HP 1600a and 1607a logic analyzers, and HP 3760A serial data generator. All used for debugging temperamental old electronics. now that I see this in pictures, need to clean it up. Maybe I'll post an after picture once It's spotless. That might take a few years, though. Once I get finished building my new lab this place will be a lot cleaner. Clean it up? Naw, that's a "thinking man's desk"!!! 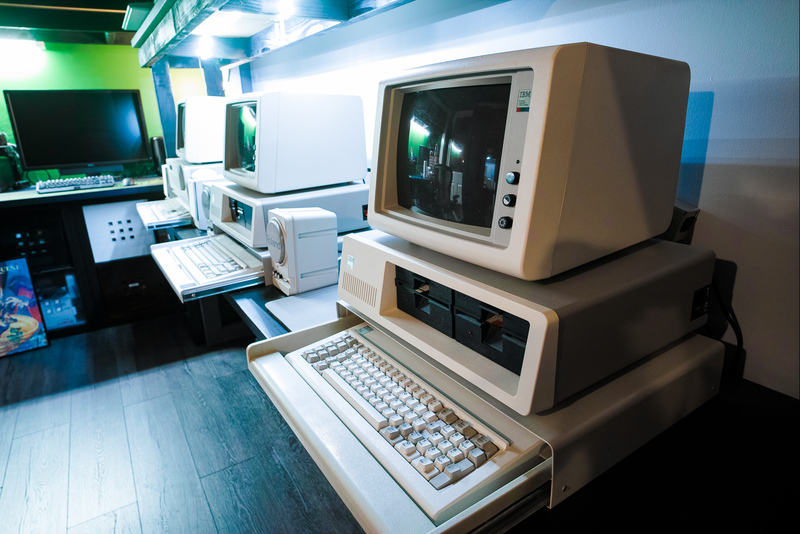 dkarguth wrote: Newly built 286 machine, 12 MHZ, 1 MB of RAM, IBM CGA adapter, MediaVision Pro Audio Spectrum 16, Intel Etherlink 16, and 1.2 GB HDD. Cleaned up my desk a little today and put down a ModMat. This is my general build/work area. 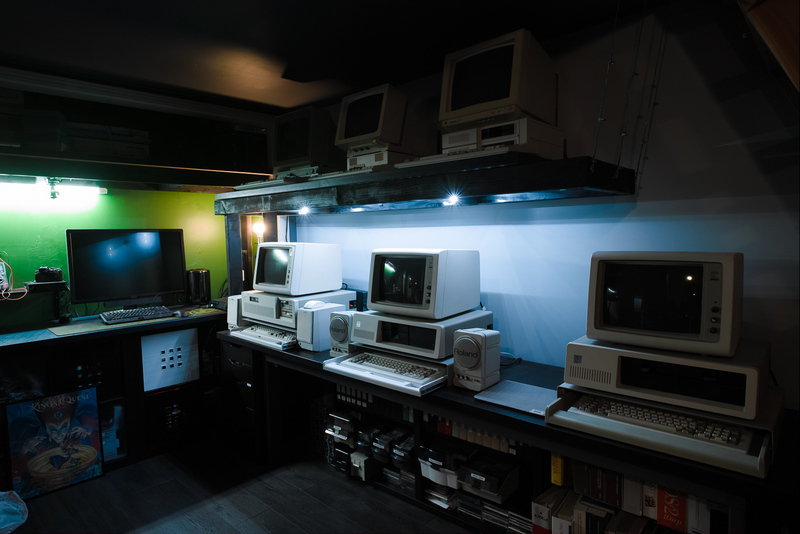 I don't know if this question was asked before... Do you move, change or replace, your computers in work area frequently? That is what happens to me. Well, I'm in the middle of moving from one room to another thanks to my sometimes loud neighbours, so I needed the room to get some better sleep at night. I can tell you, It's no fun! Again I see that I have wayyyyyy to much stuff and I really need to move some of it (again, it keeps growing on me) and make some choices. It is a lot of work to move it all and making good use of the space I have. When done I will post some pics.